Great environment to livesubmitted by Barnard M. - Apr 03, 2019 |Recommended: YesMy wife and I enjoy the peaceful setting of our apartment at the Overlook. The maintenance staff take care of the facilities regularly and address any requests we have in a timely manner. The leasing office staff are friendly and easy to work with. Awesome Place to livesubmitted by Mukesh P. - Mar 24, 2019 |Recommended: Yesyou will not face any issue .everything is good here. Awesome place to livesubmitted by Abhijit K. - Mar 12, 2019 |Recommended: YesStaff is very friendly. maintenance staff is pro-active and quick in case any issue. Kids playground is missing but the rest of things are flawless n better than any. a lot of parking space. We really like the complex and view over the golf coursesubmitted by Donnie S. - Feb 08, 2019 |Recommended: YesVery comfortable place to live with a very friendly staff. It's a bit more expensive than similar complexes but the location is very convenient for us. The only annoyance I have is that, at times, the neighbors upstairs can be quite loud. But, I've experienced worse before. It's a very nice area to livesubmitted by Terry S. - Jan 01, 2019 |Recommended: YesI would recommend this area to live. It's close to the freeway and other amenities. Parking does get full , walls are thin and if you live by the street it is very busy and construction nearby other then that everything was good. Quiet, homey and clean.submitted by Esmae N. - Dec 05, 2018 |Recommended: YesMy favorite part of living at The Overlook Apartments is how quiet it is. I love how clean the area is, how close to the I-15 freeway and how central this spot is. Okaysubmitted by Nonoy S. - Nov 06, 2018 |Recommended: YesQuiet neighborhood - no trouble. Great place to live. Well maintained complex.submitted by Clinton W. - Jun 18, 2018 |Recommended: YesApartments are well maintained and surrounding area is beautiful. Well worth the expense. Great, clean place in a beautiful area submitted by Kianna W. - Jun 06, 2018 |Recommended: YesBeen here about 4 months and we love it Beautiful area, good parking, and convenient access to the 15 freeway. Nice and organized communitysubmitted by Hamidreza M. - May 03, 2018 |Recommended: YesAfter four years residency in this community , me and my family still want to live here and keep our good experience and memories. One of the best apartment complexes in Northern San Diego submitted by Gian P. - Mar 14, 2018 |Recommended: YesI've lived here for about half of my military career and I just want to say that it made my experience in San Diego so much more enjoyable. They honestly do a great job of taking care of you and making you feel at home. The Overlook is right next to a country club golf course so you have the serene background right on your back porch. The apartments are very spacious compared to the other complexes around the same area. It might be on the more expensive side, but you get what you pay for. Quality apartments. There's only one thing I could note and it's that the walls are kind of thin. But it wasn't that noticeable. You're in an amazing community just minutes away from grocery stores, a shopping plaza, everything you need is just right down the street. I recommend anyone who wants to stay in a nice, quiet, luxurious complex to stay here. 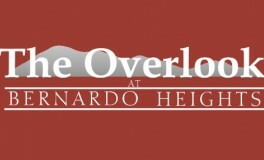 The Overlook has been home to me on 3 separate occasions. submitted by Faith S. - Mar 10, 2018 |Recommended: YesI have LOVED living here. The property is maintained beautifully. Every time I have dealt with the staff, it has been pleasant. Thank you Dee, Mallary, Ellis and Mike for your kindness. I will miss seeing you on a regular basis. Also, the place feels like a resort. They just remodeled the community room leasing office. It looks spectacular. The pool has always been my favorite place to entertain and destress. This is one reason I keep coming back here. We are buying a house and that is why we are moving, but I will miss it here very much. I am actually sad to go because I know that we most likely won't be back because I think we have found our forever home. However, in order to give an honest review, I would like to add that it is very easy to hear your neighbors. The walls are really thin. If you are not bothered by it, then you will be fine. Excellent housing in the North County submitted by Zachary R. - Mar 01, 2018 |Recommended: YesQuiet, and peaceful community, majority of area is retired or family commuters. Facilities are pristine and staff very accommodating. Good place to live in. Prompt in collecting monthly pay. Do not delay But slow in returning your deposit.submitted by Roberto M. - Feb 03, 2018 |Recommended: YesIt is highly recommended to any of my friends.